Ceramic tiles are some of the most versatile floor and wall coverings available today. They come in a multitude of sizes, patterns and colors and can be laid in countless ways. Using any classic pattern can help transform a standard tile job into an extraordinary one. The tiles may be the same color, or they may contain two different colors or two different materials, such as ceramic and glass to produce different effects. 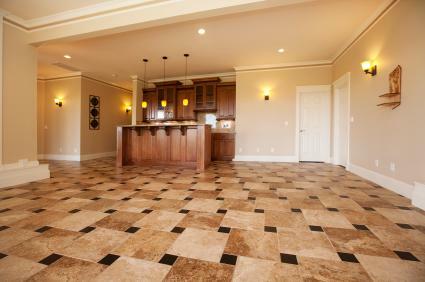 There are countless tile patterns available for use with ceramic tiles. 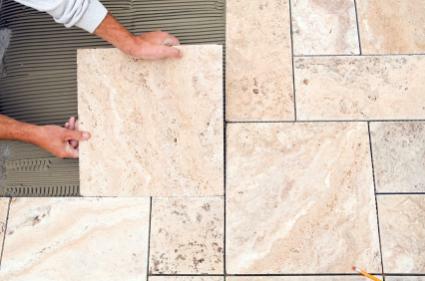 Some tile companies will bundle their tiles together with a specific pattern in mind, while others can be created simply by purchasing tiles of varying sizes. Some of the most popular tile patterns are also the oldest. They can be recreated with any type of ceramic tile and fit into nearly any home. 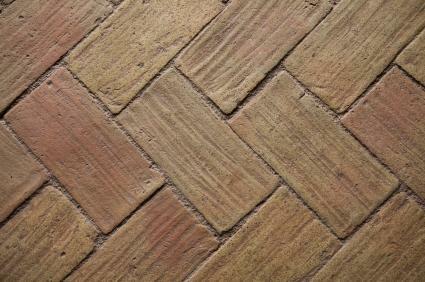 A herringbone pattern is made up of rectangular shaped tiles, all of the same size. While the most classic size is 3- by 6-inches, any size of rectangle can be used, including 2- by 4-inches, 4- by 12-inches or 12- by 24-inches. Herringbone patterns work well on backsplashes, confined to the area behind the cooktop, or over large floor areas, such as foyers or mudrooms. The smaller the tile size you use, the busier and more intricate appearing the pattern will be. Start your herringbone pattern in the upper left hand corner of a wall tile installation, or in the left hand corner of the room that is furthest from the door for a floor tile installation. Lay a full tile horizontally in the corner of the area. Lay a full tile vertically to the right of it. It should extend out past the horizontal tile into the rest of the area to be tiled. Cut a full tile into two equal pieces. Place each of the two pieces on the other side of the vertical tile. Place the other cut piece directly below the horizontal tile, against the left hand edge of the installation. Lay a second horizontal tile to the right of the first cut tile. Lay a vertical tile directly below the second cut tile. Place a vertical tile into the gap between the second cut tile and the first vertical tile, so this new vertical tile abuts the first tile laid. This will give you the beginning of the herringbone pattern. Continue alternating vertical, cut and horizontal tiles along the two edges of the installation and alternate vertical and horizontal tiles on the inside of the installation until you reach the two opposite walls. Cut the remaining tiles to fit the space. The hopscotch tile pattern, or step tile pattern, uses two tiles of different sizes. While it is common to use a 6-inch tile with a 12-inch tile, any two sizes can be used, including 2-inch with 12-inch tiles or 6-inch with 24-inch tiles. When laid properly, the smaller tiles should appear to be jumping or stepping off the larger tiles. For added complexity, choose a decorative ceramic tile for some or all of the smaller tiles to add interest to the design. Begin in the left corner furthest from the door. Lay a full, large tile in the corner. Place a smaller, full tile directly to the right of it, against the far wall. Cut a larger tile in half, and lay half a tile directly below the first full tile, against the left wall. Place a full, smaller tile to the right of the cut tile, so it is directly below the larger tile. Place the other half of the cut tile horizontally next to the first small tile, against the back wall. Lay a full, large tile beneath the first small tile and the horizontal cut tile. Continue alternating large, small, half tiles along the back wall. Alternate large and small tiles into the inner area of the room, moving at an angle toward the right corner of the room. A target pattern uses two sizes and two shapes of tile. In this pattern, rectangular tiles encase a square tile in their center. The rectangular tiles should be the same width as the square, but twice its length. Common size combinations include 4-inch squares with 4- by 8-inch rectangles and 12-inch squares with 12- by 24-inch rectangles, although any combination can be used provided it follows the same size ratio. Begin in the left hand corner of the room furthest from the door. 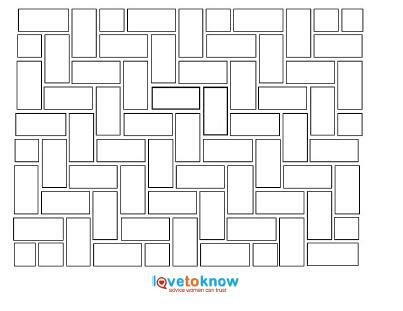 Lay a rectangular tile horizontally in the corner so it stretches to the right. Lay a second horizontal tile vertically against the left hand wall so it abuts the first tile. Place a square tile inside the inverted "L" shape that the two rectangles create. Place a rectangular tile vertically just to the right of the square tile. Place a rectangular tile horizontally just below the square tile. Repeat this pattern across and into the room. 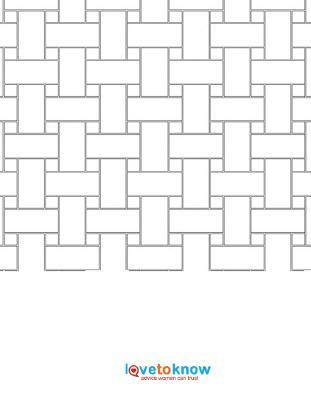 The basketweave tile pattern is most commonly seen in mosaics, but it is easily recreated in larger tiles as well. The pattern works best when two different colors of tile are used, one color for the rectangular tile and one for the square tile. To create the correct ratio of square to rectangular tiles, select square tiles that are exactly half the width of the rectangular tile. For example, use 2-inch square tiles with 4- by 8-inch rectangular tiles. Decorative or brightly colored square or circular tiles can help delineate the pattern further. For a more subtle look, use glossy square tiles with matte finished rectangular tiles, both of the same color. Place a square tile in the left hand corner of the room furthest from the door. Place a rectangular tile vertically to the right of it. 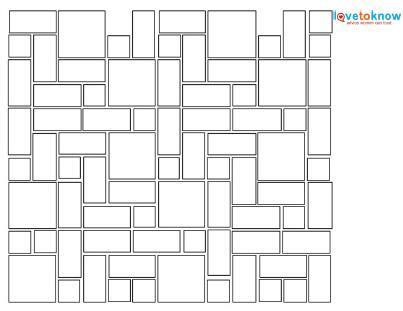 Cut a rectangular tile to the same width as the square tile and place it horizontally below the square tile. Place a second square tile beneath the cut tile, and two more square tiles directly opposite the first two on the other side of the full, vertical tile. Place a full vertical tile horizontally to the right of the full vertical tile so its end rests between the two square tiles. 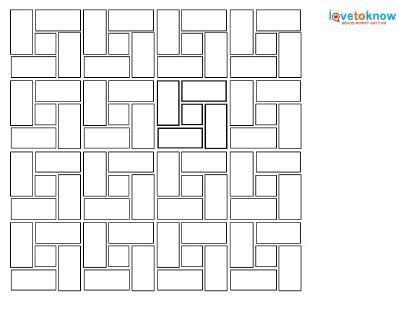 Reverse this pattern and repeat so each rectangular tile has two square tiles on either end. Continue repeating the pattern. The variegated tile pattern is made up of three tiles, two squares and one rectangle. The small square must be one quarter the size of the large tile; for example, you could use a 6-inch tile and a 12-inch tile. The rectangular tile must be twice the length of the small tile, or in this case 6- by 12-inches. This pattern works very well with large size tiles as well, such as 12-inch, 12- by 24-inch and 24-inch. The variegated tile pattern does not repeat itself quickly; the different pieces are continuously changed into different configurations like a jigsaw puzzle for several feet before repeating again. Because this pattern does not repeat for several feet, it will change slightly based upon the shape and size of the room. Follow these tips to help lay it out properly. Begin in the corner of the room furthest from the door and branch outward. 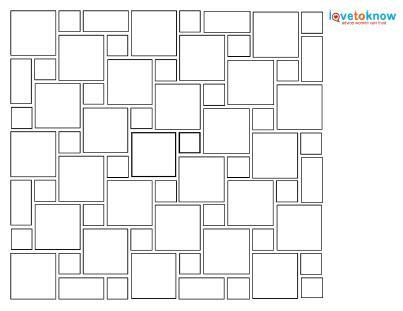 Lay out six to 10 tiles at a time, consulting the pattern sheet before taking them in the reverse order you laid them. Spread mortar over the floor and replace the tiles in the correct order again to install them. Then lay 6 to 10 more tiles. This will keep the pattern consistent and allow you to correct mistakes before the mortar hardens. Step back across the room and compare the tiles on the floor to the printed pattern. Get creative. If the tiles don't seem to be fitting properly, change their configuration. This type of tile pattern can be endlessly rearranged because the tiles are all in the same size ratio to one another. If you need help downloading any of the printable tile patterns, check out these helpful tips. Play around with several tiles before you lay them in mortar. Make your cuts ahead of time, during the dry layout and confirm that they fit with the rest of the pattern before you install them. Don't assume that your room is square. Many walls are not completely in plumb, so always double check that the tiles fit before you lay them. Leave room for grout joints in the pattern. Because the pattern should be laid out without mortar, and cuts should be made ahead of time, it's easy to forget about the grout joint. Machine made ceramic tiles need at least a 1/16-inch grout joint, while handmade ceramic tiles may need as large as a 1/4-inch joint. Ceramic tile patterns can dramatically transform any space. Whether you are adding color and detail to a small bathroom floor or dressing up a subway tile backsplash, consider laying your tiles in a pattern to create a more interesting effect.